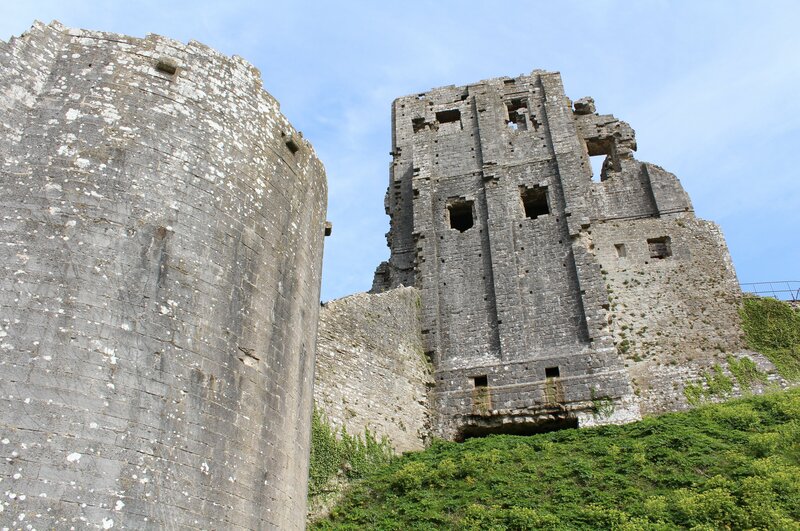 Corfe Castle is without doubt one of the most iconic landmarks of southern England. With a history going back over a thousand years, it has been a feature of the landscape for far longer than the railway has and provides a fascinating contrast and depth to the heritage railway. 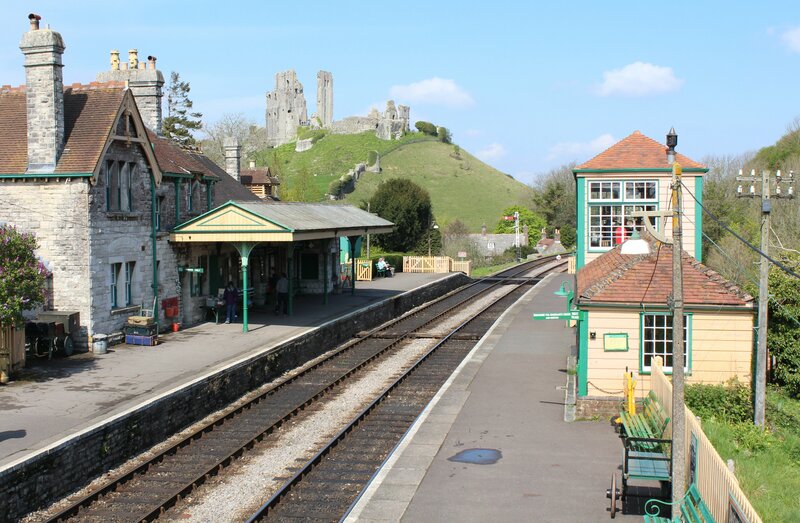 Anyone who visits the Swanage Railway should take some time to make the most of Corfe Castle by visiting the National Trust property and also explore the area and station, it really is so beautiful! It’s not often we look too far away from heritage railway’s on this blog, but this article wouldn’t be complete without a little detail on the castle itself. It is a very short walk away from the Swanage Railway’s station and accessed from the village. A structure has probably stood here since Saxon times. It is thought that King Edward was murdered here in 978 by his stepmother Elfryda and half-brother Ethelred (who then took the throne). When Edward’s remains were found miraculously preserved, he was sainted. Edward the Martyr is still celebrated, with his feast day being the date of his murder, the 18th March. In Norman times a Hall stood here, but the keep was constructed more recently in the 12th Century for King Henry I. As is still the case, the 21m high keep built on a 55m hill could be seen for miles away and was an excellent strategic spot to defend the River Corfe. The Castle was in full use until the Civil War in the 1640’s, when after surviving two siege attempts it succumbed to defeat through treachery of one of its soldiers. At the time the castle was held by the staunch Royalist family, the Bankes and ‘Brave Dame Mary’ who refused to surrender to the Parliamentarians. However through betrayal of the soldier, enemy troops entered the castle. It was the Parliamentarian sappers who reduced the fortress to the ruins that we see today as a result of an Act of Parliament passed in Wareham. The Castle eventually came back into the possession of the Bankes Family, who kept it until 1982 when Ralph Bankes generously gifted it to the National Trust. Over Easter there was much going on at the Castle, with a Medieval encampment and archery (as well as the obligatory Easter egg hunts!) 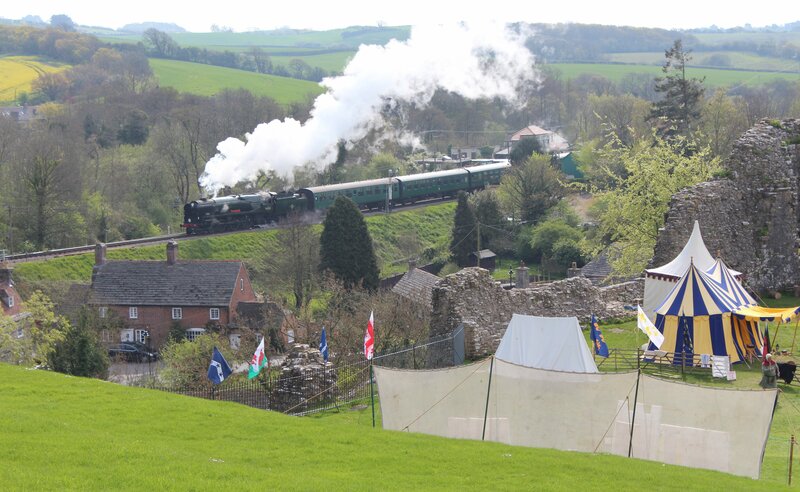 The picture below shows the tents, with 34028 Eddystone departing the station in the background. Getting back on track – the view! 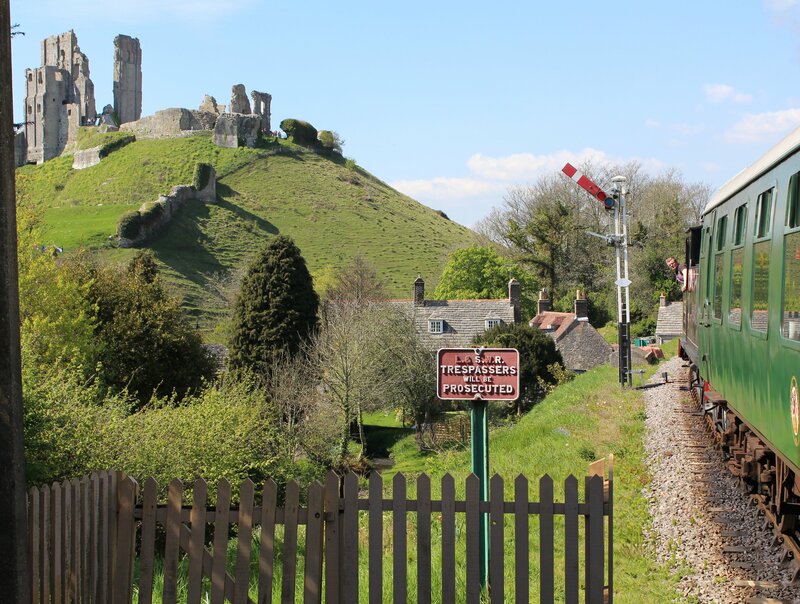 Built to defend the surrounding area, Corfe Castle provides a fantastic viewpoint of the surrounding countryside, not least the railway. Although by no means the only place in the country where it is possible to get a good view of steam engines from above, it is nevertheless an excellent one. Back on track – the station. 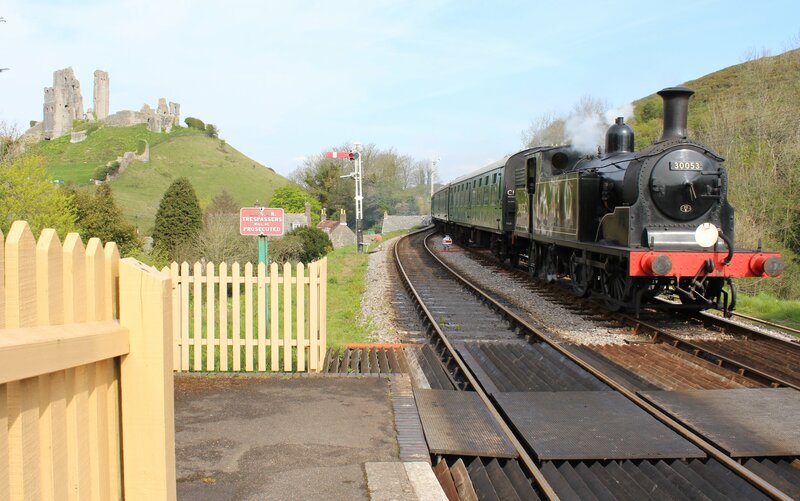 The Swanage Railway’s station at Corfe Castle is particularly well kept and very picturesque. Built after the Swanage Railway act of 1881 the station opened in 1885 and was absorbed into the London and South Western Railway (L&SWR) the following year. The station served the local clay and marble industries as well as local residents and tourists for many years, but with declining revenue it was closed by British Rail in 1972. The story of its reopening is told in a small exhibition gallery and theatre in a carriage at the station. The station is also home to several wagons and a small museum where the narrow gauge locomotive Secundus can be viewed (click here for more). As you can see, Corfe Castle is a very special place, well worth visiting. I’ve not seen it all yet, the village is lovely in its own right, with a church, model village and plenty of places for tea and cake! But these all give a perfect excuse to visit the place again in the future! ← Are Steam Locomotives Females? You can not beat a cream tea! It’s certainly on the to-do list for the next visit! It’s great hear that your FIL is a driver on the line, we’d always be happy to publish an article from him if he wanted to and help support any appeals to help the railway. Have to say that personally I prefer the steam engines too, although diesels are growing on me! I know that Simon who is one of our writers is hoping to make the steam gala this year, so hopefully we’ll have a report on the event in the not too distant future!